Cortes EV owners held a mini-faire in the parking lot at Manson’s hall during the Friday market, to promote electric transport. On display were four full size cars and three E-bikes. How much their vehicle costs? How much do they save every month in terms of reduced energy costs? How many kilometres do they get to a charge? 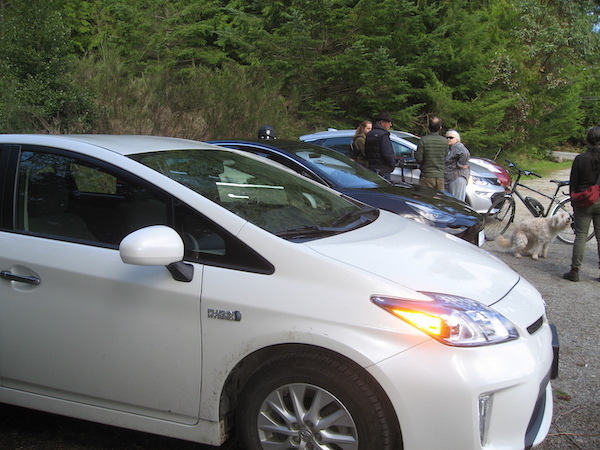 The story behind one of the first Toyota Prius (hybrid) sales in British Columbia. How EVs are like computers on wheels. 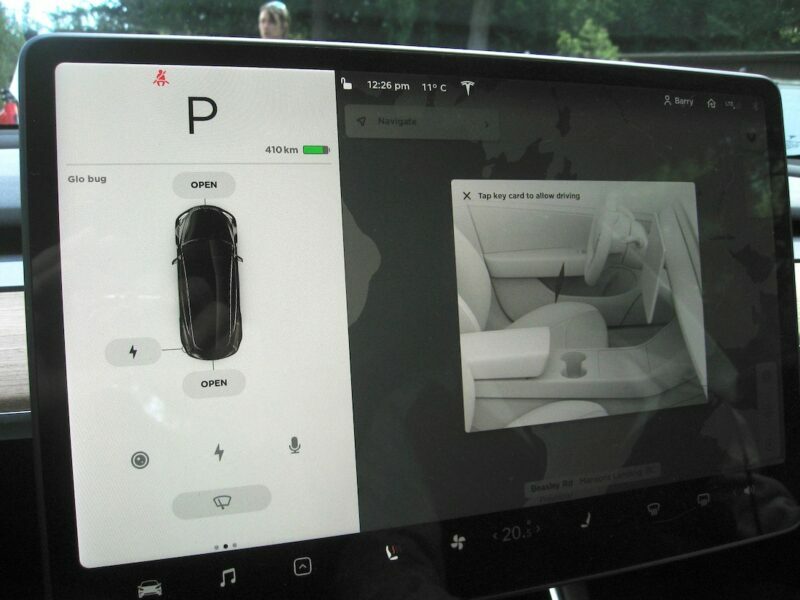 How the Tesla’s touch screen, seen above, shows every Supercharger station in the world and which stalls are empty, and makes the necessary preparations before a car arrives. Why EVs, and Teslas in particular, have such excellent safety records. Where do Teslas go for maintenance? Surveillance technology: Self driving cars; Anti-collision technology; EVs that apply the brakes if/when you do not. How reliable is an EVs surveillance technology? Does it make mistakes? How the EVs computer calculates your anticipated range. Regenerative braking; how EVS can recover energy and recharge the battery while driving. EVs with Eco Driving mode: you don’t even have to use the disc brakes, just take your foot off the accelerator and the car comes to a gentle stop via regenerative braking. Hannu Huuskonen explains how, thanks to the reduction in fuel costs, he is practically getting his Nissan Leaf for free. He has to pay for electricity of course, but the cost is minimal. 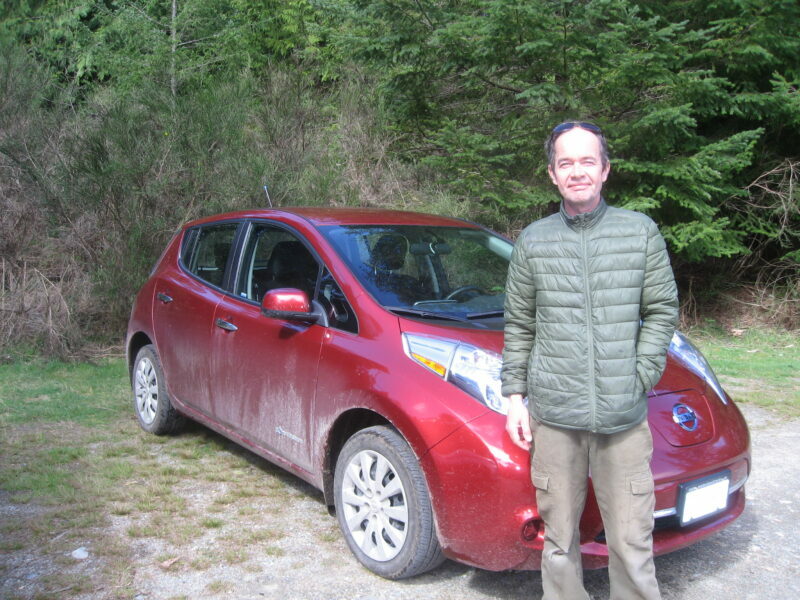 While the frequent charging stops mean that trips to Victoria or the Mainland take considerably longer, the Leaf is far more convenient than a gas car on Cortes. Hannu doesn’t have to drive out to Squirrel Cove for gas anymore. He obtains all the electricity he needs by plugging the vehicle in during his lunch break. Barry Saxifrage doesn’t have any range anxiety. His Tesla Model 3 goes more than 500 kilometres on a single charge. On routes where there are superchargers, this translates to about three hours’ driving for every half hour at the station. However the ratio abruptly changes in more remote areas where there are only level two chargers. The Saxifrages switched over to electric for environmental reasons. 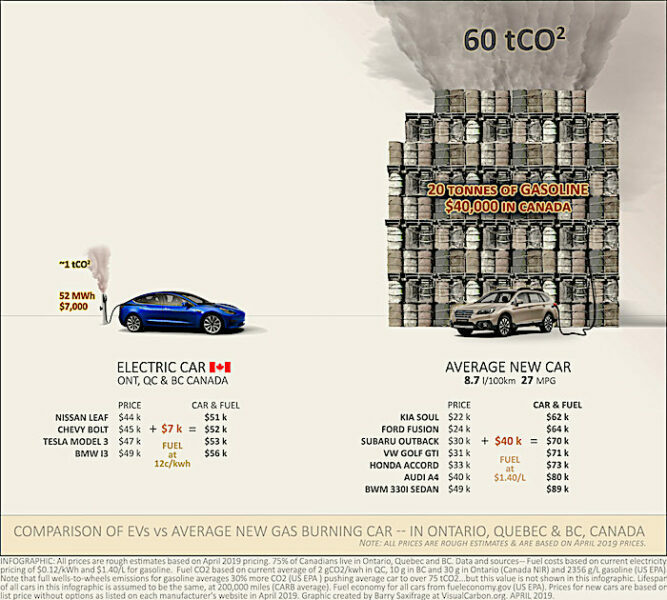 Over the course of its lifetime, the average EV produces only 2% of the CO2 used by its gas powered equivalent. Barry wasn’t fully aware just how clean an EV is until he had to replace one of the computer chips. The maintenance area was “an immaculate room; people were walking around in clothes just like we are.” There was no oil or grease. Most people do not realize that the most expensive part of a gas car is fuel. De Clarke took us under the hood of her Chevy Bolt: almost nothing we saw was recognisable. She explains how regenerative braking works to recapture energy from the car’s mass and momentum; also, how the car “tells you” how much energy you are using and rates your driving style (and prevailing conditions like terrain and temperature) to estimate your anticipated range. Sensors warn you of the proximity of other cars (or pedestrians), and if the sensors detect an imminent collision the car will slam on its own brakes. She also took some of us for a demo drive. The engine was so quiet that two people standing in front if us did not even hear the car start. I was suggesting she honk her horn; but bystanders alerted them to the car’s forward creep, and they moved aside. Apparently the Bolt could have been even quieter, but Chevy built in an unnecessary “whine” to alert nearby pedestrians at low speeds (when tyre noise is minimal). The near-silence was a surprise. So was the fact that a Bolt can go from 0 to 60 kph in six and a half seconds. Electric motors provide impressive torque. 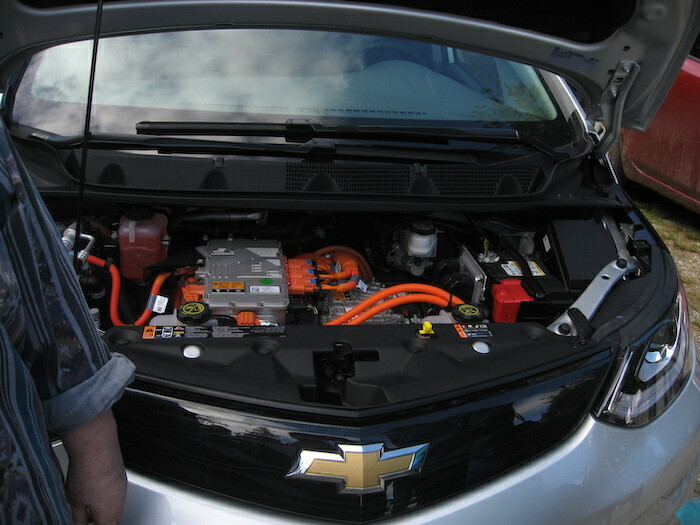 De explained that one factor affecting her choice of EV was local support; she purchased from the Chevy dealer in Campbell River and can get service and parts there. Four vehicles at the EV Mini-faire: A Prius (hybrid); Tesla Model 3, Chevy Bolt & Nissan Leaf – Roy L Hales photo. Also on show that Friday were several exciting E-bike options. 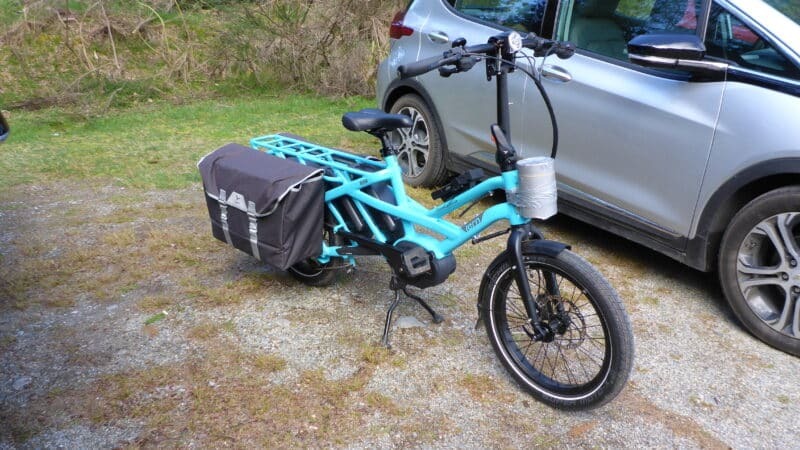 Owners confirm that modern battery technology is delivering E-bikes that can handle the hilly roads and rough pavement of Cortes Island. Bob Katzko’s “Fatbike” shown above, has huge tyres capable of softening the ride on our rough and potholed roads, and an impressive range. The heavy-duty Tern with its powerful electric drive and generous cargo space can replace a car for most errands. 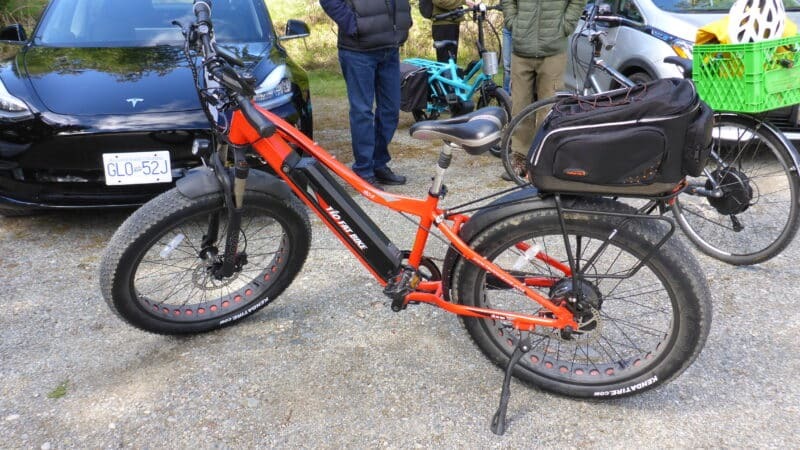 E-bike owners agreed that one could expect to pay $2000 for a basic bike, and up to $6000 for a highly specialised one. E-bike owners were happy about being able to recharge and extend their range at many locations on the island. E-car owners acknowledged that the only official public charging station is at Hollyhock, and is inaccessible off-season. Please do listen to the podcast which offers a lot more detail; this article is just a summary. Top photo credit: EVs on show at Friday Market (De Clarke).